Rika has an accident and wakes up in an alternate timeline where there is no Hinamizawa Syndrome and the dam project was approved so the town will become a lake. Her friends are now virtual strangers and her parents are still alive. Rika must find the secret in this world and destroy it so she can get back to her preferred fragment. This feels like a What If story rather than something that fits in with the overall story. It is an interesting way to see how the characters would have been different if they didn’t have to go through all the terrible things they did in the main story. Rika’s choice boils down to who’s happiness is more important; her own or her friends in that alternate world. This volume got a little preachy but not enough to put me off or derail the story. For what it is, it’s a decent diversion. But can this series be done now, please? 3.5 out of 5. After a hundred years, Rika and Hanyu have exposed Miyo’s insane plan to become a god and kill everyone in Hinamizawa. Rika rallies all her friends and allies while Miyo does the same; resulting in a battle in the mountains around Hinamizawa. Considering this series is all about trying out this same night until they get the ‘right’ outcome, I was happy with this final volume of the series. It was great to see Hanyu stop acting so passive and aloof and really fight to end this horrible cycle. And the final battle was cool to see; a bunch of kids and a few adults going up against these hardened soldiers. Nomura Takashiro pops up to help Miyo in order for the research on the Hinamizawa Syndrome to continue; as if she is Miyo’s guardian angel. Of course, Nomura has objectives of her own and is likely just using Miyo to her own ends. 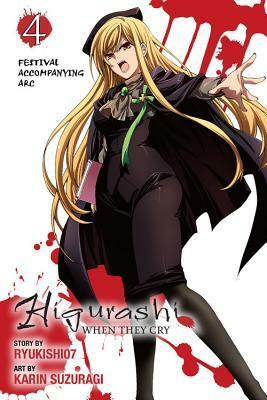 Meanwhile, Hanyu and Rika are still trying to prevent Rika’s murder by trying to convince the adults around her that Miyo intends to kill her but Hanyu and Rika have just one week to find help powerful enough to stop the organization behind Miyo and Nomura. Rika and Hanyu have done a pretty good job fixing the problems from the other arcs which enables them to collect as many allies as possible so all of this looks like it may actually work! However, I don’t trust this series. I can see them pulling a bait and switch and everything goes wrong. Sadly, I don’t give enough attention to the art here and I have to give it up to Karin. She draws crazy really well. Some of those expressions are seriously chilling. I give this volume a 4 out of 5. Miyo’s single-minded pursuit of her research may have vindicated her grandfather’s work but her methods have made her colleague, Dr. Irie, horrified by her lack of ethics or compassion. So, he and Rika work together to try and develop a treatment for the Hinamizawa Syndrome without continuously using the townspeople as lab rats. But Miyo isn’t interested in a cure. She wants to control the parasite as a weapon and won’t let anyone stand in her way. Not only is all that happening but in this last rewind, Hanyu has decided to materialize in human form to save Rika’s life as this is the last time Hanyu will be able to turn back time. If they can’t prevent Rika’s murder now, they will both cease to exist. Part of me does wonder why Hanyu didn’t think of that sooner. After hundreds of tries, why wait for the absolute last shot to come to Rika and her friends in human form to try and change things? The only reason I can think of is not they know Miyo’s part in all this so they can combat her directly. But these last few volumes are addicting! Everything from every volume is coming together. 4 out of 5. Miyoko Tanashi loses her parents in a tragic train accident and she’s dumped in a terrible orphanage where the children are starved, beaten, tortured, or even killed. Vowing to escape, Miyoko longs to return to a house filled with love like it was with her parents, but may end up with a fate worse than death. The summary on the back of the volume doesn’t do this volume justice. 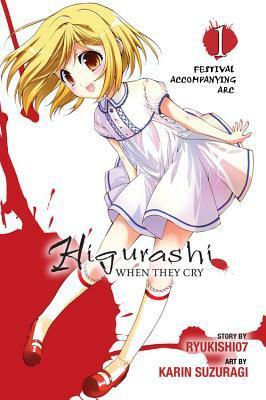 It doesn’t stop at Miyoko’s childhood but carries all the way through her life until she becomes Nurse Takano and the ruthless researcher of the Hinamizawa Syndrome. 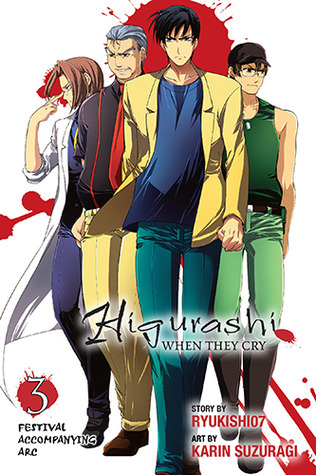 This volume also confirms the presence of a parasite unique to the Hinamizawa area which causes the victims to have psychotic breaks. And Miyo isn’t out to cure anyone, she just wants to become a god. Completely reasonable, of course. /sarcasm. Now, that more parts to the puzzle are coming together, it’s making much more sense and is more entertaining. These seem pretty reliant on the violence against children now, which is bothersome but if you can get through that, the mystery behind the syndrome is interesting. 4 out of 5. Rena tries to convince Keiichi about the parasites and a conspiracy to enforce the “curse” by fanatic believers in Oyashiro-sama but Keiichi is hesitant to agree. Without him, Rena becomes increasingly paranoid. 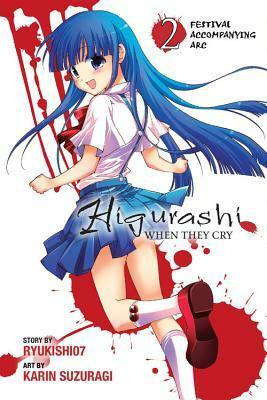 The stops coming to school and believes everyone, even her friends, are part of a plot to kill her; going so far as to think there are human clones around her and one will eventually replace her. Going along with my time loop theory, it’s looking like those timelines are intertwining, since Keiichi is getting flashes of murders he committed in previous volumes. The only one who seems to really know about these alternate events is Rika and as such, I’m getting some Madoka Magica vibes. I think they are all stuck in a loop, Rika is the only one fully aware of this loop, and is trying to end the loop in a way that saves all her friends. Interesting… 4 out of 5. Having done what she believed she needed to do to protect her father, Rena’s shocking deeds are discovered by her friends. All of them band together to help Rena since they regret not being able to save Satoshi in the past. They help cover for Rena and decide to forget everything so they can go on as normal. That is until the local nurse, Takano, stirs up Rena’s interest in Oyashiro-sama’s Curse then Detective Ooishi comes to investigate the murders of Takano and Tomitake on the night of the Cotton Drifting Festival. With all these cycles, it’s Takano and Tomitake’s deaths which seem to be a fixed point. They end up killed the same way on the same night every time. In this volume, we learn every resident of the village is infected with a parasite and that’s what’s making them hallucinate and kill people. Rena puts it together by reading this scrapbook Takano gave her before she was killed and now Rena believes there’s a huge conspiracy to keep it all quiet and the same people who murdered Takano are after her. While I like that as a possible cause of all this, it all seems too perfect. Maybe I’ve had some of Rena’s paranoia rub off on me but I do have some doubts. Better keep reading to find out. This series it really good at leaving you enough questions to keep grabbing up the next volume. 4 out of 5. 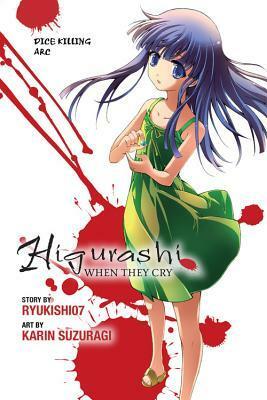 In this volume, Keiichi learns the story behind the Cotton Drifting Festival – it is actually a cannibalistic human sacrifice. The day after the festival, Mion starts acting very suspicious; especially concerning Keiichi handing out with her twin sister, Shion. 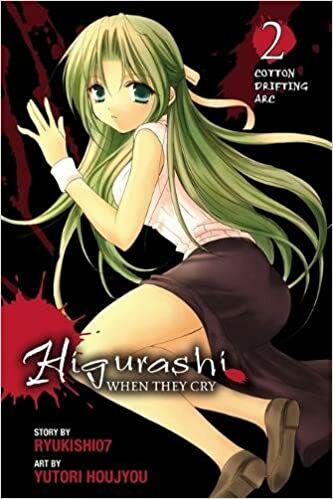 As the disappearances and murders begin again, Mion reveals she is heir to the demon curse of the village and is forced to fulfill the Cotton Drifting killings and has been trying to keep Keiichi safe. But is she lying? Is the demon even real? This series… This series is weird. Are these kids trapped in hell or in a time loop cycling this curse thing over and over in different scenarios? Is just Keiichi cursed? I did notice the editions of this I’m reading are divided not only into different arcs but each arc is split between the slow set up and burst of chaos. But then everything resets. I am so confused. 3.4 out of 5. Yes, I know it’s the Cotton Drifting arc number one but I’m doing the overarching series numbers because it’s easier for me to keep track. Keiichi is back and him and the girls decide they’re gonna play their penalty game and wear some embarrassing costumes. Seeing the costume Keiichi ends up wearing, his dad takes him to a themed restaurant and see his friend Mion works there. At least he thinks it’s her but it turns out to be Mion’s twin sister; Shion. Shion is the polar opposite of Mion; a sweet, girly girl who loves to cook. Keiichi is convinced it’s Mion pretending to be girly so she wouldn’t be embarrassed but nope, Sion is shaping herself to be a rival against Mion for Keiichi’s affections. As the Cotton Drifting Festival approaches, the Oyashiro-sama Curse threatens to take another live. This volume is much more silly than the previous ones. The tone was so different, I had trouble getting invested. If I didn’t already know it will get all fucked up again in the next volume, I might not have bothered to continue reading. And that’s all from the expectation of this being a horror manga and getting a lot of slap-stick shenanigans. 2.5 out of 5.